After the snowstorm on January 22–23, 2016 dropped 26.8 inches of snow on New York City, lists circulated of the worst snowstorms in the city’s history dating back to 1869. Of the top ten storms, only one occurred in the 19th century: the blizzard of 1888, which resulted in 21 inches of snow falling on the city from March 12–14 of that year. “Entrance to the Astor House facing Broadway between Barclay and Vesey Streets. Taken in March 1888 during the Great Blizzard.” From Strong, The Great Blizzard of 1888. The blizzard arrived unexpectedly. The forecast for Sunday, March 11 called for slight wind and evening rain. But late that night, a storm from the south altered its course at the same time that the wind changed direction. Rain turned to sleet, hail, and finally snow. New Yorkers woke up on Monday to 10 inches of snow and bitter cold. 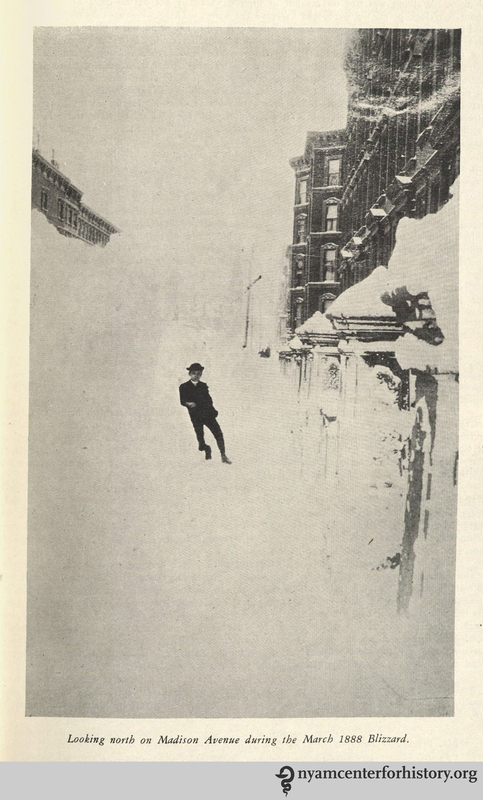 “Looking north on Madison Avenue during the March 1888 Blizzard.” From Strong, The Great Blizzard of 1888. 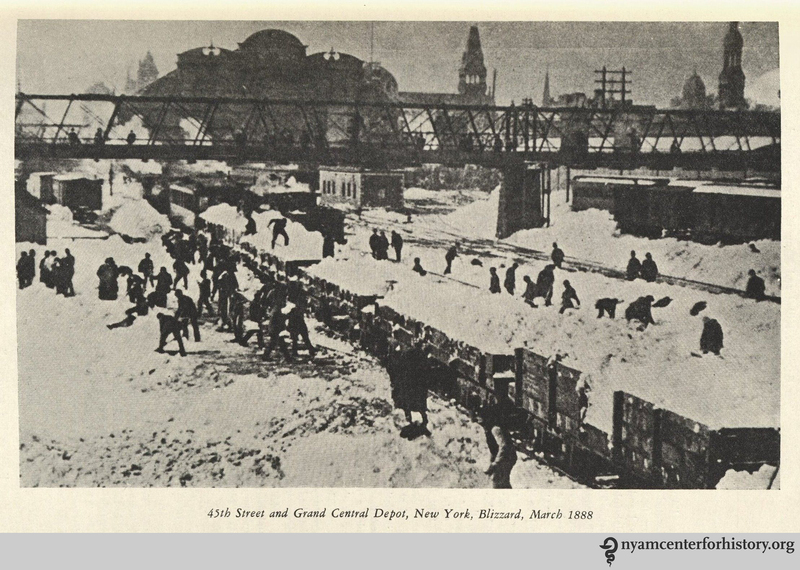 “45th Street and Grand Central Depot, New York, Blizzard, March 1888.” From Strong, The Great Blizzard of 1888. 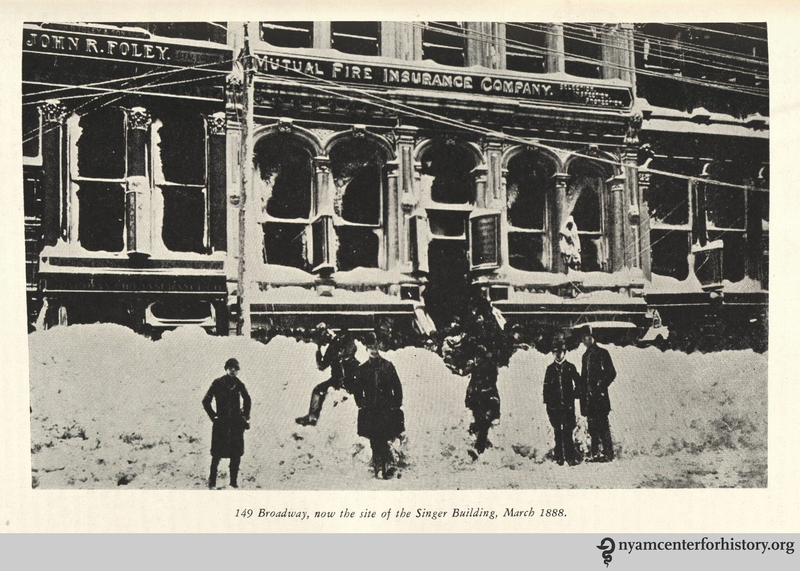 “149 Broadway, now the site of the Singer Building, March 1888.” From Strong, The Great Blizzard of 1888. 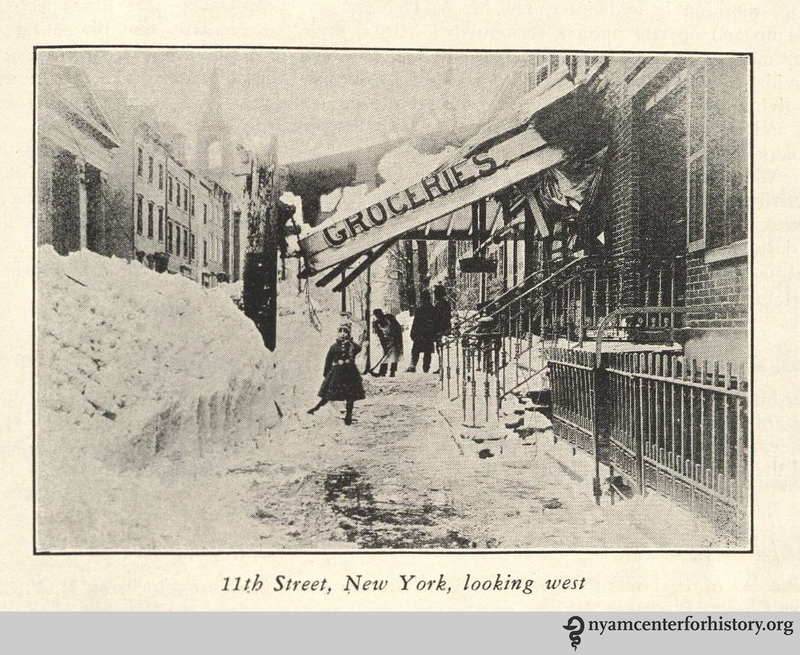 11th Street, New York, looking west.” From Strong, The Great Blizzard of 1888. “Copy of photograph taken in Flushing, Long Island, by Mr. William James in March 1888. 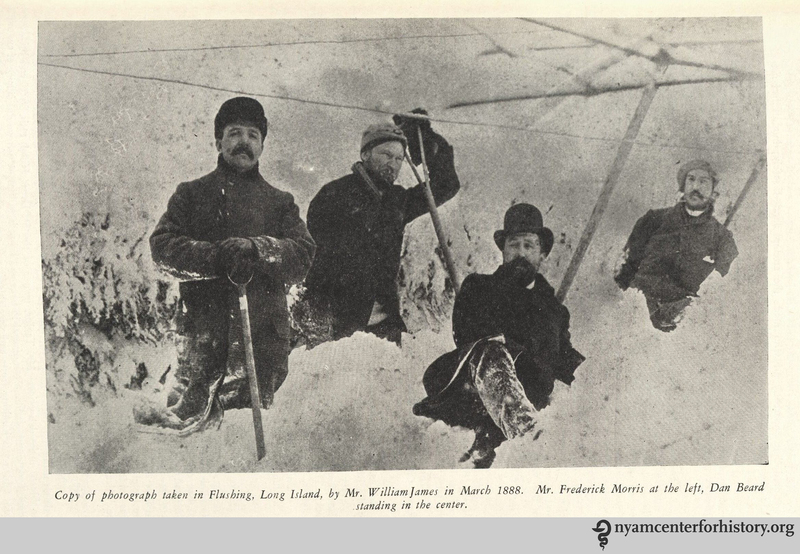 Mr. Frederick Morris at the left, Dan Beard standing in the center.” From Strong, The Great Blizzard of 1888. 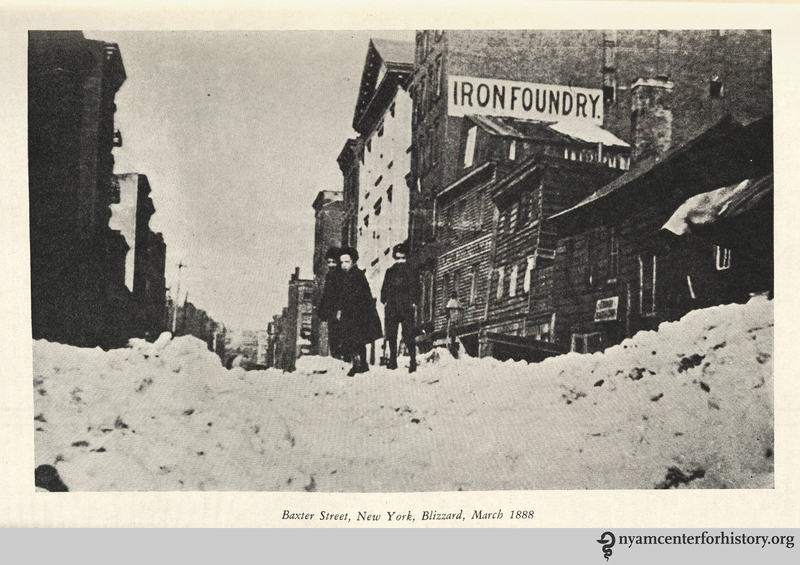 Baxter Street, New York, Blizzard, March 1888.” From Strong, The Great Blizzard of 1888. 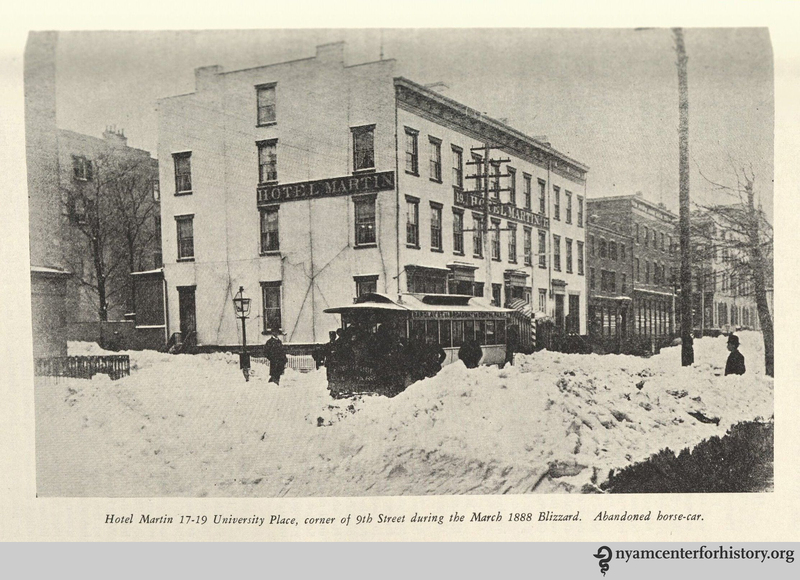 Hotel Martin 17-19 University Place, corner of 9th Street during the March 1888 Blizzard. Abandoned horse-car.” From Strong, The Great Blizzard of 1888. 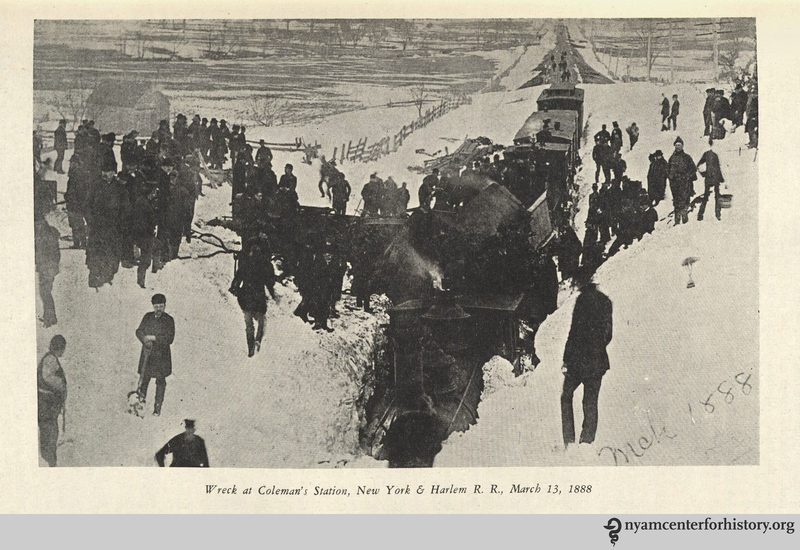 “Wreck at Coleman’s Station, New York & Harlem R. R., March 13, 1888.” From Strong, The Great Blizzard of 1888. 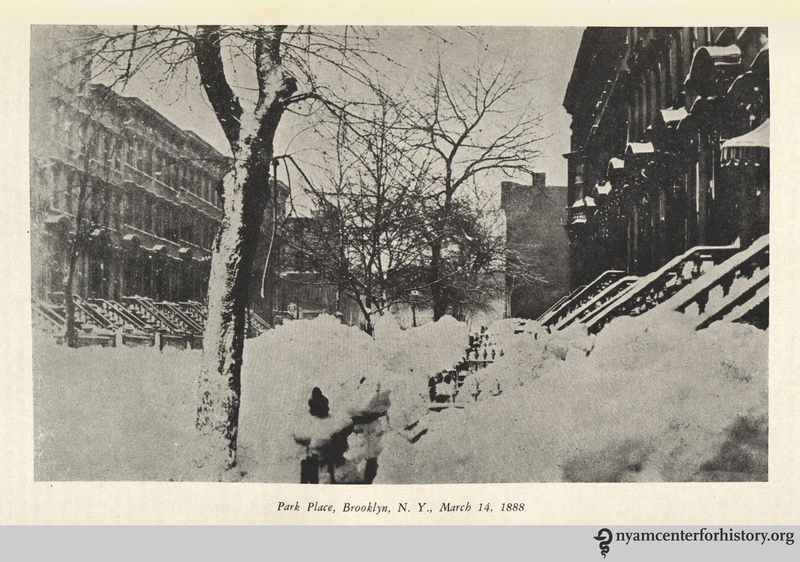 Park Place, Brooklyn, N. Y., March 14, 1888.” From Strong, The Great Blizzard of 1888. The next time a blizzard comes to New York, be grateful for modern weather forecasting technology and heated subway cars. And don’t try to cross the East River by foot! 1. Virtual New York. Blizzard of 1888. Available at: http://www.virtualny.cuny.edu/blizzard/bliz_hp.html. 2. Strong SM, Overton M. The great blizzard of 1888. [New York]; 1938. 3. GUNCOTTON KILLS THREE. Explosion Wrecks Factory and Shakes a New Jersey County. New York Times. http://query.nytimes.com/gst/abstract.html?res=9D00EEDB1438EF32A2575AC1A96F9C946596D6CF. Published September 19, 1914. Accessed March 4, 2016. 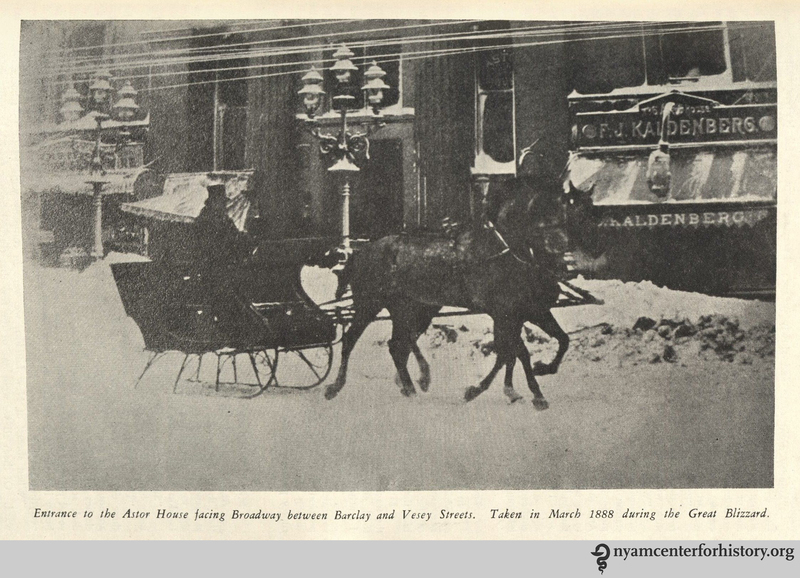 This entry was posted in Collections, History of medicine and tagged blizzard, Blizzard of 1888, natural disasters, New York City, weather by nyamhistorymed. Bookmark the permalink. Amazing photos! The story about the infants being fed on the extra Borden’s condensed milk diluted with barley water – and thriving – was touching. How did the NYAM come by this book? There is no bookplate telling us the fund or donor, but there is a stamp saying we acquired it on March 13, 1939.